Ըստ սկանդինավյան աշխարհաստեղծման առասպելի՝ առաջին էակը, որ առաջացավ Գիննունգագապ կոչվող նախաստեղծ քաոսից, մոնումենտալ չափերի հսկա Իմիրն էր։ Երբ Նիֆլհեիմրի սառնամանիքը հանդիպեց Մուսպելսհեիմրի տաքությանը, Իմիրը ծնվեց այս երկու հակադիր ուժերի միացումից։ Սթուրլուսոնի Գիֆլագիննինգում այսպես է նկարագրվում Իմիրի ստեղծումը. ↑ Shippey, Tom (2005). "Giants". The Shadow-walkers: Jacob Grimm's Mythology of the Monstrous. Arizona Center for Medieval and Renaissance Studies/Brepols. pp. 83–110. ↑ translated, Snorri Sturluson; Faulkes, edited by Anthony (1995). "Gylfaginning". Edda (Reissue. ed.). London: Dent. ISBN 978-0-460-87616-2. ↑ 3,0 3,1 Orchard, translated by Andrew (2010). "Vafthrúdnismál". The poetry of the Elder Edda. London: Penguin Classics. ISBN 978-0-140-43585-6. ↑ Orchard, translated by Andrew (2010). "Grímnismál". The poetry of the Elder Edda. London: Penguin Classics. ISBN 978-0-140-43585-6. ↑ Motz, Lotte (1982). "Giants in Folklore and Mythology: A New Approach". Folklore 93 (1): 70–84. doi:10.1080/0015587X.1982.9716221. ↑ Abram, Christopher (2011). 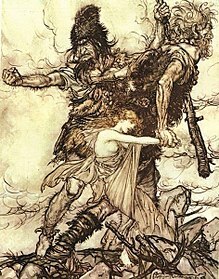 Myths of the Pagan North: The Gods of the Norsemen. London: Continuum. Ciklamini, M. "Odin and the Giants." Neophilologus 46.2 (1962)։ 145-158. Hofstra, Tette and Kees Samplonius. "Viking Expansion Northwards: Mediaeval Sources." Arctic 48.3 (1995)։ 235-47. Motz, Lotte. "Giants in Folklore and Mythology: A New Approach." Folklore 93.1 (1982)։ 70-84. Wanner, Kevin J. "Cunning Intelligence in Norse Myth: Loki, Óðinn, and the Limits of Sovereignty." History of Religions 48.3 (2009)։ 211-46.